"On commencing employment with our firm it was clear to see that our Quality Management System had been neglected for a long time. Having no previous experience with QMS and ISO:9001. I undertook the related training courses which provided some assistance but the task of creating a full new QMS for our business was still a very daunting task. I was recommended to Christine Brown by Bureau Veritas and she was nothing short of a lifesaver. Christine assisted me in understanding and interpreting the standard in a straightforward, uncomplicated way. With her imparted knowledge and under her guidance we were able to rewrite the former defunct QMS in a matter of months. This led to our full reaccreditation of our QMS and most importantly and comprehensive, effective system that incorporates our daily processes and has readily been adopted by our staff. I would recommend the services of Potential Unlocked for anyone requiring assistance with the interpretation and understanding of a QMS and ISO9001. In addition the services were reliable, competitively priced and personally Christine was and continues to be a pleasure to deal with." "Christine has provided Datanet with invaluable assistance by working with myself and my staff advising, mentoring and working with us to make sure all our processes are up to date and clearly documented in a way that makes sense to us and add value to my business. 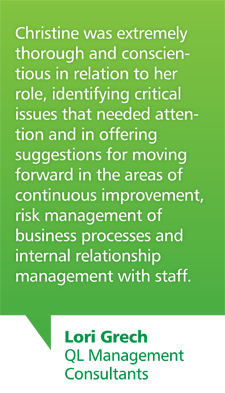 This approach greatly assisted us when achieving ISO 9001 re-certification. I have found Christine to be professional, ethical, easy to work with and knowledgeable in all areas to do with quality systems, audits and continuous improvement." "We selected Potential Unlocked to guide us though the ISO9001 certification process, after reading through the testimonials from her existing and previous client base. We found Christine to be an extremely efficient and experienced mentor. Her interpersonal skills and close interaction allowed us to draw on her in-depth knowledge and extensive experience to draw up our quality plan exactly in keeping with our business outlook – simple and manageable. She was always well prepared and understood our specific needs very quickly and guided us through the entire process with minimal fuss and well within the specified time frame. Consultations and services were professionally delivered and always practical. Her diligence and attention to detail simplified the entire process and we would have no hesitation in recommending Christine's services." "Christine has helped Screwpile Australia maintain and improve their ISO9001 system and guided various new staff members through the processes required. She has been an invaluable resource throughout and has aided Screwpile through a successful recertification process." "Christine offers a professional service without the double-talk. She makes the often confusing technical jargon contained within ISO 9001 into the ABC with her unique combination of experience and a warm, friendly demeanour. Not your average auditor, Christine is willing to go the extra mile to ensure you understand the requests being made of your company and the instructions she gives you therein. I have found my own personal understanding of Quality Management Systems increasing during her audits and management have commended the concise nature of her audit reports containing straightforward actions designed to prepare you for certification and keep your QMS running smoothly. I would recommend Christine’s services to anyone seeking a knowledgeable, professional and friendly auditor." "I have received positive feedback from my staff about Christine that she is very knowledgeable about the QMS and how it could be applied to our business. All agreed work was done in a timely manner and I would be more than happy to recommend Christine to other companies." "Our manufacturing business recently engaged Potential Unlocked to commence our journey in attaining ISO 9000 certification. Christine attended the meetings and worked very well with the staff and management. All interactions were personable, accurate and took into consideration the context of our business, that still has to run during this process. Christine showed her extensive knowledge in the quality system and how to match this to our workplace current practices. All promises of documentation and data and follow up were sent to us in a very timely fashion. I would have no hesitation in recommending her to any prospective customers." 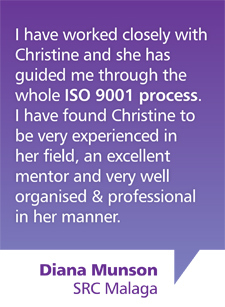 "I have worked closely with Christine and she has guided me through the whole ISO 9001 process. She has interacted closely with all staff members clarifying the ISO terminology and how ISO 9001 Management System and certification will benefit our company. I have found Christine to be very experienced in her field, an excellent mentor and very well organised and professional in her manner. Thanks a million for all your help, we do really appreciate it." "Christine mentored staff members and the impression I received was that they were well mentored and supported all the way through. Christine is a very good communicator from the first meeting through to the conclusions and always came well prepared. The feedback reports were very clear and the turnaround time of the report was a few days only. Your knowledge about the ISO 9001 was very good, but more impressed I was about the ability to understand the specific needs of our small company set-up in regards to the ISO 9001 requirements. The process of putting together our ISO 9001 handbook, and preparing us for the certification was planned to do in 2 months only. The achievement to finalise everything and achieve certification within this 2 months’ timeframe, was due to your knowledge and understanding of our needs in regards to the ISO 9001 requirements. Thank you very much." "The collaboration with Christine Brown form Potential Unlocked was an excellent experience. We managed to get certification for ISO 9001:2008 within six weeks only! Although the company is a small subsidiary, we had to plan the course of the project, to describe the working processes, to implement new workflows and to introduce the non – conformance procedure. Christine Brown has been guiding me through the regulations and giving valuable advice in order to keep the quality-manual simple and manageable. She always has an answer and knew the ISO Standard almost by heart. Due to the very tight timeframe given, it was necessary to help and cross check the documents even outside the business hours, which was very much appreciated. She has been very flexible and has been well prepared for the meetings and the audits. Dealings with all the involved team members were, thanks to her interpersonal skills, going very smoothly. I would always recommend to working with Christine Brown. Again many thanks for the valuable work!" "As a sub-contractor for QL Management Consultants Christine undertook a comprehensive gap analysis against the Australian Business Excellence Framework (ABEF) as a precursor to creating an environment for continuous improvement. Christine was extremely thorough and conscientious in relation to her role, identifying critical issues that needed attention and in offering suggestions for moving forward in the areas of continuous improvement, risk management of business processes and internal relationship management with staff. She worked very effectively with the CEO and Executive Leadership Team through to all levels of staff and we only received positive feedback in relation to her work. I would have no hesitation in utilising Christine’s services again given her high level of expertise and professionalism." "The facilitator was very helpful and informative." "Ran a very interactive workshop." "Personal experience shared by Christine (real cases)." "Very informative and met my expectations." "I thoroughly enjoyed the course and walked away with a greater understanding of ISO 9001. Christine was excellent! Extremely knowledgeable and kept what can be a boring subject interesting." "Facilitator Christine Brown was the key to this course's success." "Christine was a fantastic facilitator. While the study of any standard is not very exciting, she made the course very interesting and informative." "Very good presenter with excellent subject matter knowledge." "The course was very well facilitated and Christine engaged exceptionally well with the participants. I know feel confident to conduct audits within my organisation." "Christine Brown was an excellent facilitator and her wealth of experience and knowledge within the role itself made me feel as though I was learning internal auditing from someone who knew how the process works best." "I found Christine very engaging and passionate about all subject matters. Great speaker would recommend her to anyone." "Great course more beneficial than expected." "The group activities were really good as it kept the course practical and interesting - no sleepy moments for me." "I was pleasantly surprised by the exercises we conducted in writing a good objective for our proposed internal audit. In the past I have found writing objectives for any type of plan or report to be one of the hardest things to do. Christine helped us focus on making the objective meaningful, simple, and easy to evaluate whether we had/could achieve it. It was very liberating and I'm sure I'll continue to write objectives in 'Plain English'. Thank you!" "Christine tailored the presentation methodology to our small group well and integrated the learning with our various circumstances. She focussed on the concepts that are the foundation for the processes and took time to review the program outline and its intent with us." "I really benefited from the two day course and will be able to use the concepts in my role as a consultant." "The case studies helped aid in the understanding of the concepts and theories learnt in class. Christine Brown was knowledgeable, easy-going and made the class very interesting by providing real case scenarios." "Very well presented, excellent examples used and all good answers were given to questions that were asked of the presenter. I can go straight back to work and apply all the information I learnt." "I really enjoyed and benefited greatly from this course. Thanks Christine." "The Course was very well facilitated. Well done Christine." "A very professional and knowledgeable facilitator." "Christine is an excellent trainer who brings her wide experience to the task. She is focused and uses her humour very well." "I really enjoyed the trainer’s personal experiences." "Christine is a very good facilitator! Good facilitation makes learning process better." "I feel the learning experience has been invaluable for me." "Facilitator did a great job in keeping our attention over the 5-days." "Had a ball, thanks Christine." "Christine is a very effective and professional trainer." "Delivery plus experience of the trainer highly commended. Real life scenarios plus experience was excellent." "Christine was very clear with her information and brought great experience and expertise to the training." "I found the course very enjoyable, informative and very professionally run. Keep doing what you are already doing." 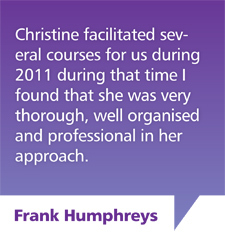 "Christine was able to show her extensive topic knowledge to deliver an excellent training package. Thank you." "Absolutely satisfied. One of the best courses I have sat to date." "Christine is a clear speaker, very informative with relevant experience and stories."